According to sources, the oil tanker was going from JNPT to Silvassa when it lost control and turned turtle on the Patlipada flyover, near Hiranandani Estate. An oil tanker turned turtle after the driver allegedly lost control and rammed into the divider on Thane’s Ghodbunder Road. No one was injured, but traffic was held-up for over five hours, Thursday morning. According to sources, the oil tanker was going from JNPT to Silvassa when it lost control and turned turtle on the Patlipada flyover, near Hiranandani Estate. The driver, identified as Jeetendra Pal, suffered minor injuries. Fire brigade and emergency vehicles where immediately rushed to the spot. “We stopped the traffic on the flyover and immediately began clearing up the oil,” said a fire fighter present on the spot. Traffic was stuck for close to five hours and vehicles were moving slowly due to the flyover being closed. Several commuters kept away from the main roads and took the longer routes between societies in that area. “We put a thick layer of soil on the oil spill. 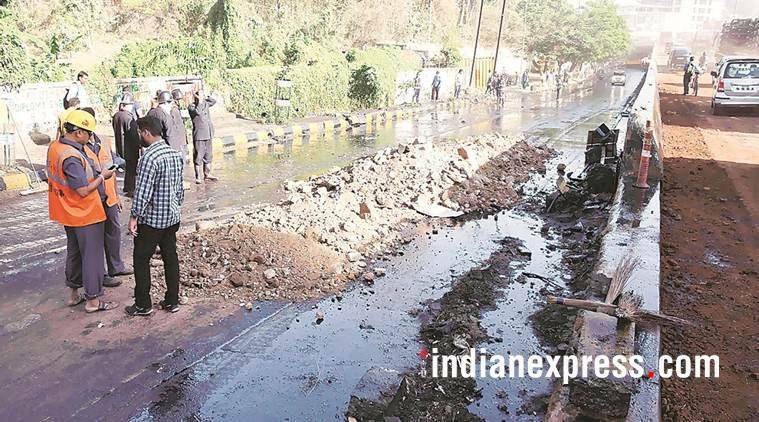 No injuries were reported and eventually the traffic has picked up speed too,” said the Thane Disaster Management Cell incharge Santosh Kadam.